Wow, I wasnt aware of these other giveaways going on. Lucky I watched more of your videos on Marvel reveals, last video I watched was the one about the ToysRUs news, as I myself was a former employee from them. Thumbs up man keep up the vids! hey Jay C , whats your favorite figure line and why? Also which Figure line company do you think is the best/favorite? Mine is Neca, heroes of the storm , favprite figure is Thrall the Orc from warfract, he is my favorite orc. ANd I chose neca because of the quality of their designs and the price for them. I want to get the new big buff predator figure from the new movie. I order alot from these sites for a close one who lives in the UK, due to import fees and stuff. Jay C, I am wondering if there are any custom figure artists on this site. 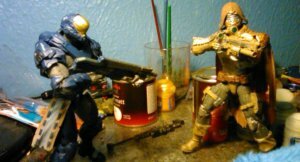 My best friend makes customs and has a collection of figures he likes to work with sculpting and molding and casting. Ok so I am going to assume it is this page that you post in to gain entries. If Jay C or anyone can confirm this plz let me know. Im eager. sooo, i have a question, i been watching Jay C's youtube for awhile. this is the first time i come here. So what posts apply to the entries??? Reply posts??? or thread posts?? ?